The arena promised to bring people downtown, and it did – and they’re all driving. Rogers Place opened less than a year ago, and has already welcomed more than two million visitors through its turnstiles. According to Susan Darrington, the Oilers Entertainment Group (OEG)’s vice-president and general manager of Rogers Place, that’s ahead of projections. That means more visitors, more vehicles needing to be parked and more people on the streets. It means more traffic, but it should also mean a boom for local businesses. But, truth is, we’re all still working to figure out just how the arena fits into Edmonton’s revamped downtown. Some businesses are seeing wild swings in their rush hours – busy before and after games and concerts, but unnervingly quiet when the band is on stage or Connor McDavid is making yet another spirited dash down the ice. And, the biggest issue, the one he says the city is “still playing catch-up” on, is parking. The Lingnan is located just north of the arena, a few steps from the eerily empty MacEwan LRT station (on P.52). 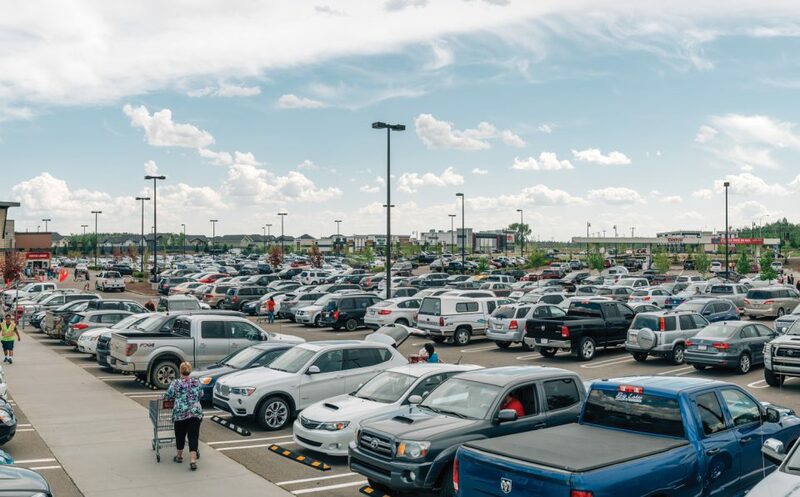 When Rogers Place opened, drivers going to games or concerts would leave their vehicles in the free spots in front of the restaurant, leaving no spaces for restaurant patrons. Miles and his sister, Mandy Quon, met with the OEG’s Stu Ballantyne and the North Edge Business Association to hammer out a solution. In the end, the city put a two-hour limit on the parking spots – long enough for someone to eat at the restaurant, but not enough time for someone going to a concert or game to leave their vehicle behind. Darrington says that meeting with neighbours has been a priority for her staff, whether it be businesses, residents or the nearby social agencies. And, along with the city, OEG is encouraging its patrons not to hunt for free parking that infringes on others in the downtown core. “We sought to find ways to protect the neighbourhoods, especially to the north, because no neighbourhood should be treated like a parking lot for events or for employees of a nearby institution,” says McKeen. It’s not that there’s an issue with parking availability close to the arena. There are several underground lots that offer $10 flat rates, a bargain compared to what it would cost to park close to Vancouver’s Rogers Arena or the Air Canada Centre in Toronto. There is street parking and a large surface lot near Rogers Place. It’s the fact that many visitors don’t want to pay a single dime for parking, and will look for nearby residential or commercial areas for it. McKeen says he’s received complaints about parking from as far away as Riverdale, located in the valley below downtown. According to Miles and Mandy, there has been a slight uptick in business at the restaurant since it opened. But the parking issues early on, and the fact that businesses to the north are literally walled off from the arena district by the LRT line, have had impacts. South of the arena, in the 104th Street district, the Blue Plate Diner has seen its business change. The “dead when the game is on” issue is one that will hopefully be addressed as more people move downtown. What McKeen hopes is that, when more residences open, the people living downtown who aren’t going to the games and shows realize that these are great times to go out and support their local restaurants. When the game is midway through the second period, they can get into a lot of great restaurants with no lineups. The idea of making sure lots of parking is available downtown, and wanting residents to walk the streets more, seem at crossed purposes, but they are not. According to Darrington about, 50 per cent of Oilers guests come from outside of Edmonton. McKeen says we need to recognize that, for most of those who come from outlying areas to the downtown, they are going to use their cars and pickups and SUVs to get here. They need parking. What do you think of the downtown parking rates?